LKQ returns to the wonderfully atmospheric Unitarian chapel on Newington Green for an acoustic performance. £11 in advance (Including booking fee), £13 on the door; £5.50 in advance for MU, students, under 16s (incl. booking fee), £6 on the door. Featuring Miryem-Khaye Seigel, Adrianne Greenbaum's Fleytmuzik with Brian Glassman and Rayhan Pasternak, MC Psoy Korolenko, Dance Leader Sonia Gollance. 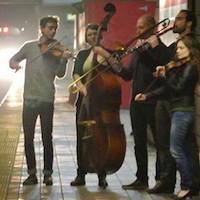 Open jam for all musicians—bring your instrument and dancing shoes! train to 205th St. or the 4 to Moshulu Parkway. Admission: $10. For more information, call 917-930-0295. 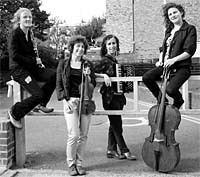 The London Klezmer Quartet returns for a summertime course designed for instrumentalists (including keyboard players) from all musical backgrounds, classical, folk or jazz. Applicants must be of at least roughly grade 4 level (no formal qualifications needed), and an ability to read music helps, though it’s not essential. The LKQ’s coaching is all about interactive learning. They concentrate on repertoire and attention to melody, accompaniment and ornamentation, and if appropriate will also introduce dance elements to the course. Oral and aural learning methods will help those unfamiliar with it acquaint themselves to the style more quickly - though we hope for many return visitors! Putting music into its historical context is an important part of the course, as is the telling of stories of musicians past and present. With solid klezmer roots, spectacular technical virtuosity, and a wry sense of humor, Ilene Stahl and an all-star line-up of Boston's best musicians re-groove traditional klezmer and Mediterranean melodies, rip up Romanian surf tunes, cover cop show themes and cumbias, slay a few standards, and burnish it all to a funky finish.Since 1999, the six-piece instrumental band has delivered irresistible dance music from everywhere except your cousin's bar mitzvah. Klezperanto's fans know: It's No Hora Show! 2nd Thursday of each month: Balkan, gypsy, klezmer, Russian music - even a bit of Turkish or Greek.... come and share your tunes at the 2nd Thursday East European jam, downstairs at The Harrison from 8pm every month with house band 'Bucimis Trio' (Susi Evans, Matt Bacon and Chrisina Borgenstierna). 1:00 at 65 Upland Rd., and 4:00 at Temple Ohabei Shalom. Brookline's 2nd Annual Porchfest is coming up soon! On Saturday, June 10th from noon until 6pm (rain date: June 17), porches across the town will be sharing music with their neighborhood. 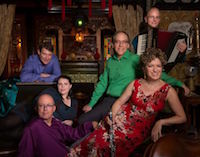 Sunday, June 11, 2017, 4:30 p.m.
An elegant as well as nostalgic program devoted to treasures of Yiddish song and the poetry that has inspired this musical expression in all its variety of style. Presented in the intimate chamber music setting of a traditional classical Liederabend (song evening) appropriate to the immediacy of this cherished genre, the recital will feature four of its leading interpreters: Ida Rae Cahana, Elizabeth Shammash, Raphael Frieder, and Alberto Mizrahi together with world renowned virtuoso pianist Yehudi Wyner. Offerings will include songs by Lazar Weiner, Moses Milner, Solomon Rosowsky, Solomon Golub, Janot Roskin, Mikhl Gelbart, Mordecai Gebirtig, Joel Engel, and Maurice Rauch, along with artistic settings of some of the most beloved Yiddish folksongs, and capped by melodious echoes of the best of Yiddish theater. The concept and content of this Yiddish Liederabend has been devised by YIVO’s Anne E. Leibowitz Visiting Professor in Residence in Music, Neil W. Levin, who will deliver the pre-concert lecture on the development of the Yiddish lieder tradition and its literary basis. Central Park near E. 72nd St. & 5th Ave.
Martha Graham Cracker is considered to be Philadelphia’s best cabaret performer. Created by Dito van Reigersberg, Martha is a powerful 6 foot+ cabaret singer, comedian, and entertainer. In obvious need of manscaping, Martha and her band will provide a marvelous and moving evening of song. Martha was a year-long artist-in-residence at the National Jewish Museum and has performed at the Philadelphia Museum of Art, Joe’s Pub in NYC, L’Etage, and elsewhere. After the show, enjoy an audience talkback with Martha and Abe Rybeck, founder of Boston’s Theater Offensive. The Sidney Krum Young Artists Concert Series is made possible by a generous gift from the Estate of Sidney Krum. This concert explores the legacy of composer Lazare Saminsky. Born in Vale-Gotzulovo, Ukraine in 1882, Saminsky was one of the earliest members of the Society for Jewish Folk Music in St. Petersburg – a group of composers committed to forging a new national style of Jewish classical music infused with Jewish folk melodies and liturgical music. Saminsky immigrated to the United States in 1920 where he co-founded the League of Composers in 1923, and was the music director of Temple Emanu-El from 1924-1958. Saminsky’s oeuvre represents a broad cross section of Jewish music ranging from sacred to secular. His songs set texts in Hebrew, Yiddish, Ladino, and more, and his music takes its inspiration from all around the Jewish world. This concert features some of Saminsky’s greatest compositions alongside composers of his new- and old-world coteries including Joel Engel, Joseph Achron, and Lyubov Streicher. Performances by Emanu-El’s Cantor Mo Glazman as well as Eliza Bagg, Brigid Coleridge, Julian Schwartz, and Marika Bournaki will feature a variety of songs and chamber music with violin, cello, and piano.